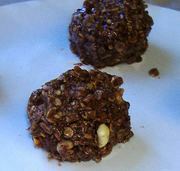 This week's Carnival of the Recipes will be all about balls, so for Chocolate Friday, I give you Missouri Mud Balls. This recipe was given to me by a boyfriend's ex-girlfriend, but it never worked right. Come to find out, she wrote the amounts all wrong. My guess is she still had a thing for the boyfriend (who turned out to be a bit of a player, but that's another story), and she may have been trying to sabotage me. Or maybe she was dyslexic, who knows. She and the boyfriend are now long gone, so I have nobody to ask, and I've had to play with this recipe a lot to get it to work. Following is the latest revision. I'm on my way to the store for peanut butter (and latte), and I'll add pictures later today. UPDATE: Pictures added. Mix sugar, butter, vanilla, milk, cocoa and salt in a sauce pan. Bring to a rolling boil and cook for 1 minute. Remove from heat and add peanut butter and oatmeal, in small amounts, stirring well between additions. Drop by teaspoons onto waxed paper on a plate or cookie sheet and use your fingers to form them into balls. Chill and serve. I think I'll try these balls with a lacing of marshmallow creme as well and see how they turn out. Will update post later! It's been a while since I made these, and I'd forgotten how gloopy they can be. In fact, as you can see from this photo here, they look more like Mississippi Cow Pies when you first slap them down on the wax paper. Since I wanted balls, though, not cow patties, I added more oats to make the batter much stiffer. Almost 2 more cups than the recipe called for! This allowed me to form the dough into balls, finally. Also, the dough is quite hot right out of the pan, so don't try to form the balls right away. In fact, I put the trays in the freezer for 5 minutes. The dough was much easier to shape into balls. I'm going to heat them a smidgy before serving them. I like my balls warm. Hot is even better. *sigh* I tried to make it through this post without any potty humor, I really truly tried... but I just couldn't do it. do you have a chocolate dough mud ball recipe that you roll up, roll in sugar and when it bakes it comes out like a flat sugar cookie? I tried these also. They are awesome. Thanks so much. I used to have these as a little kid. These are awesome. Thanks for the recipe. oops! did not finish my name in my post above. OH! YUMMM! more chocolate goodies,I have already taken my jar of chocolate treats, and put it up in a high cupboard so I have to go get my step stool to get a chocolate, or ask my sweetheart to reach one down for me. I found when the jar was on the counter, I would be taking a 'treat' every time I went by, baaaad !!! may as well just slap the chocolate right on my hips! Yesterday i did not miss my ;treats' though, I did have one small piece of Mr. C's birthday cake. Happy Happy New Year to You and Yours.